1. Epocrates: This is one of the most widely used applications by doctors boasting more than 1 million active members. Doctors rely on this app to look up information regarding drugs, other providers, referrals and to instantly calculate values such as the body mass index. 2. Read: This application brings all your journals and medical literature under one roof. The app uses a magazine format allowing you to access journals, studies and articles from a variety of sources such as PubMed, open access journals, and papers uploaded by linked institutions. 3. Doximity:This application provides the largest professional medical network in the US. Doctors use Doximity for secure communication, electronic faxing, and to read the latest medical news. 4. NEJM This Week:This application allows access to recent articles, images of medical conditions, audio and video summaries. 5. Figure 1:This application allows you to securely share medical images and information regarding cases and treatment with a medical community. This tool is particularly useful for doctors seeking feedback on rare conditions. The amazing app guarantees removal of identifying information and uses face-blocking software. 6. DynaMed:This application provides summaries of different topics and disease references with constant updates. 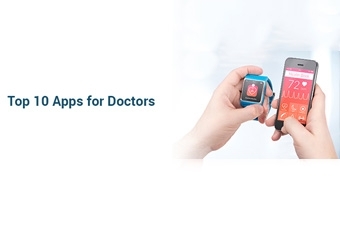 The app is created by doctors for doctors and is useful for treatment at the bedside (point of care). 7. Medscape:This free app is a medical reference tool that allows doctors to look up medication, diseases, and latest medical news. 8. Virtual Practice for Doctors: This application allows doctors to communicate with their patients remotely while having access to their medical data. This enables doctors to conveniently manage their medical practice with greater efficiency. 9. Calculate:Calculate is an effective point-of-care tool that is particularly useful in the field of oncology, cardiology, and obstetrics. This app helps doctors make informed decisions regarding diagnosis, prognosis, treatment, and dosages of medications. 10. Omnio:This is a very popular clinical research application which includes a library reference where important information can be researched and stored. Access to Merck Manual, the best-selling medical textbooks, is also available. As the world becomes increasingly connected through the internet and apps that allow instant access to vital information, doctors will certainly be able to provide fast, accurate, and high quality treatment for their patients.